The modern UI styles Youtube apps for Windows 8 are seeing their launch every day, and there numbers are increasing. While Google has still not released an app Dedicated for YouTube on Windows 8, but there are many apps available in the market which makes browsing and watching the YouTube videos on Windows 8 easy. The interface being very easy and the features being very nice, a free app YouTube8 is used by many. The users who use the official YouTube app on their mobile phones are most likely to find that the third party apps have a lot of disadvantages. There is some good news for all the Windows 8 users. Their search for a good YouTube app on the Store will end when they will find MetroTube. This is considered to be the most downloadable and the most popular YouTube app and now it has been launched for Windows 8 as well. The developers of this app have officially launched it and now it is available even on the official Windows 8 store. 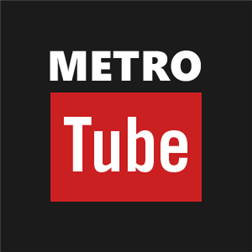 The users who had used this MetroTube app on their smartphones are very familiar with the very easy interface it offers and the wide features present. MetroTube app goes very well with the modern UI so all the users who had been using other apps to view videos on Windows 8 will find this app to be the best. On the right side of the screen, various lists like watch later, favorites, uploads, and recently played are shown and on the right side the popular videos are shown. On the extreme right of the screen categories are shown. New categories can be added by tapping on the plus button. Clicking on any category shows all the popular videos of that category. By default all the Videos are shown in the 360 p resolution, but they can be changed to the higher resolution such as HD (720p) or Full HD (1080p). This quality can be changed from Options which will appear when one goes to the right edge. The streaming of the video also reveals various information regarding the video, like total number of views, likes and dislikes, published date, account name of the uploader, and also comments. Another awesome feature is that the user can directly give comments on the Video and reply to his comments. This app is one of the best found till date and I do not understand how it is different from YouTube because it has all the features of YouTube.